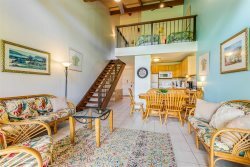 Spacious, ground floor studio condo located at Ku'ilima Estates East on the grounds of beautiful Turtle Bay Resort. This unit is equipped with a king bed in the bedroom and a flat screen TV. There is a small lanai off of the bedroom with lovely views of the mountains and the 17th fairway of the Fazio Golf Course. The kitchen has just been renovated with all new cabinetry, countertops and all new appliances. The condo has a small lanai with sitting area at the front entrance that is nice for having your morning coffee. Condo is fully stocked with linens, towels, washer/dryer and all kitchen needs such as a coffee maker, blender, dishes, pots, pans, etc. One off street, secure parking space is included. Free Wi-Fi is included in all of our units. Two pools with BBQ grills, tables and lounges for your use for afternoons in the sun.